Welcome to Concord, New Hampshire! Our wonderful downtown is full of historic Main Street charm and serves as a cultural hub of the state. We encourage you to enjoy our shops and restaurants, see a film, concert or play, and tour our historic buildings where you'll learn about Concord’s storied past. New Hampshire's state capital is a pedestrian friendly-place that feels more like a town than a city at times. 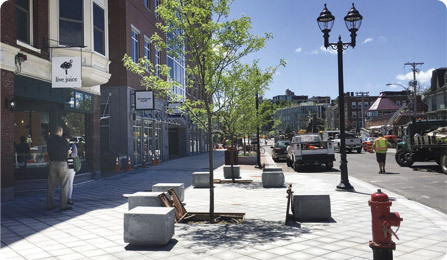 "Concord's Main Street really is New Hampshire's Main Street," said U.S. Sen. Jeanne Shaheen. "Concord is the civic heart of the Granite State." A desirable place to work, shop, dine and live, Concord is home to a variety of businesses, state agencies and nonprofits that take full advantage of local opportunities for doing business, hosting events and social gatherings, and attending cultural experiences. Concord attracts people from all over New England, the country and the world, with many cultures represented in the fabric of the community. The city celebrates the growing international population each year during Concord's Multicultural Festival. For more information about city services, our community and doing business in the capital area, please visit the City of Concord website at www.concordnh.gov .